If you want to record your gameplay from your console or do live game streaming through a service like Twitch, you need several things. 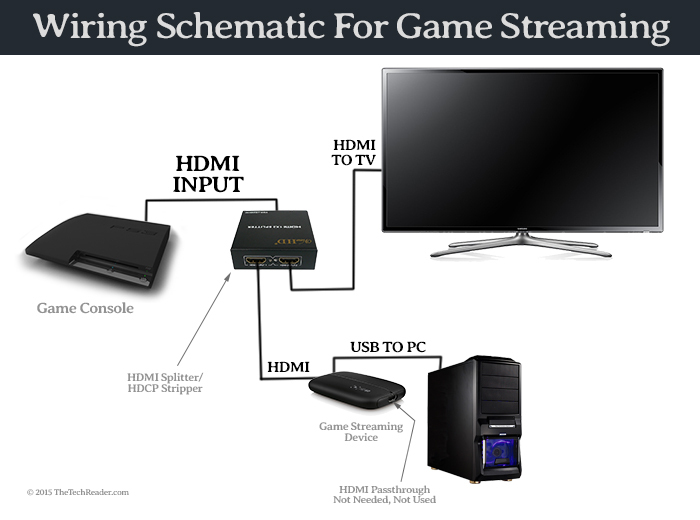 The best way to set up your game capture device for game streaming or game recording is to run from the game console into the HDMI Splitter / HDCP Stripper, and the output via an HDMI cable to the TV, and another HDMI cable to the game capture device. Assuming you already have a console and games to record, and a television or monitor with HDMI input, you mainly need three things. First, you need a dedicated game capture device. This goes without saying. There is no way to hook up your game console such as a PS3, PS4, Xbox 360, or Xbox One directly to your computer, because most graphics cards only have an output, but not an input. This goes for laptops as well, almost no laptops have an HDMI input. 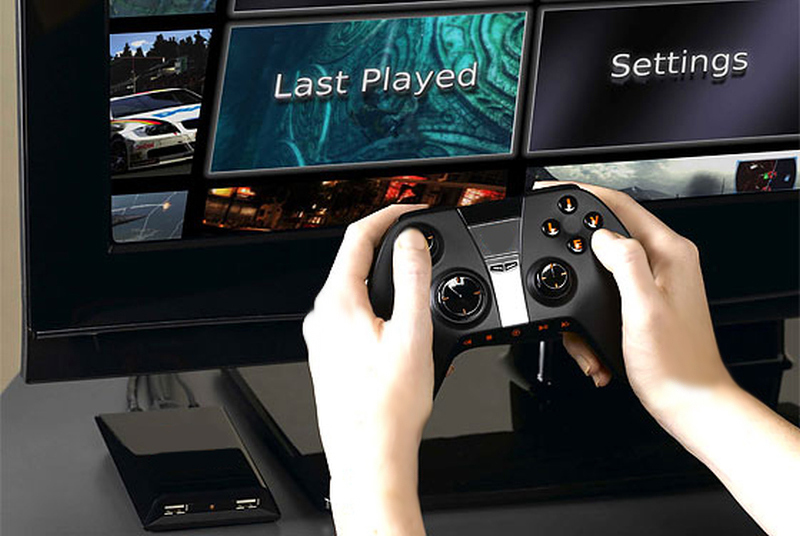 Further, the game capture device will take over some of the processing of video, as well as allow HDMI passthrough. However, you won’t be using the HDMI passthrough, but you do need an HDMI input. Without a dedicated device, even if you did have an HDMI input on your graphics card, it probably would not allow HDMI passthrough, and even if it did or you used an HDMI splitter, the graphics card may not be able to handle both processing video input and outputting an image to your monitor simultaneously. You need a high quality game capture device. 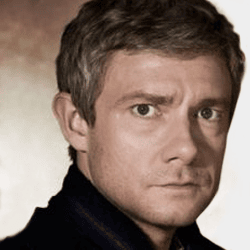 Expect to pay upwards of $200 for a quality game capture device. It’s unfortunate there are not any good ones for cheap, but being as it is, $150 to $200 is the price range you will be looking at (not including the HDMI cables and HDCP stripping device). 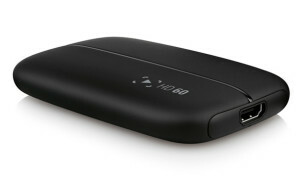 I recommend the Elgato Game Capture HD60 if you are recording PS4, Xbox One, or Wii U; or the Elgato Game Capture HD if you are recording PS3, Xbox 360, Wii, or any other HDMI game console. Secondly, you need an HDCP stripping device. There is a content protection on some HDMI devices including the PS3, PS4, and Xbox One, called HDCP. This stands for High-bandwidth Digital Content Protection. HDCP blocks the HDMI signal if you attempt to use it on a standard HDMI splitter or an HDMI passthrough device like a game capture card. If you plug it in and try to capture the picture with the game capture card, it will display a black screen no both the game capture software and your TV. As a result, you will need a device that strips the HDCP signal (or bypasses the HDCP signal) in order to record or stream your gameplay. There is no way around this. Read more about HDCP stripping on my other post. Third, you need more HDMI cables. Don’t neglect this because it would be annoying for you to spend hundreds on a game capture device and an HDCP stripper and then have to wait a few more days because you didn’t have enough HDMI cables. You will need a total of three cables. You would already have at least one because currently you have it hooked to your TV using HDMI. Also, your game capture device will probably come with one as well, unless of course you buy it used. 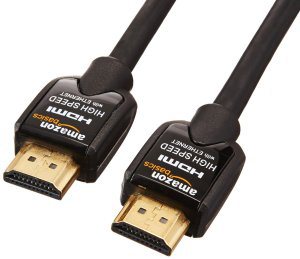 So at the very least, unless you have spare HDMI cables lying around, you will need at least one more HDMI cable. I personally have 10 or 20 HDMI cables lying around because I found a great deal once and I got 10 HDMI cables for only $1 each. Lucky me. 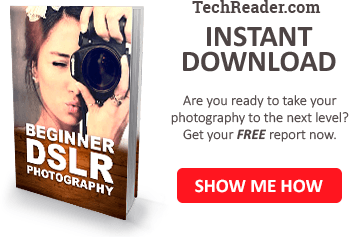 Lastly, you need quality software with which to run the capture device and record or stream video. I recommend not to use the bundled software, as it can be buggy and problematic. Instead, use the free software called Open Broadcaster Software (OBS), which is 100% free because it is open source. Youtube videos on how to use OBS are easy to find, so just do a search. At some point I will make a tutorial on how to do it. That’s it! This is everything you need to be able to record gameplay footage or stream games from your console. p.s. If you have a powerful enough PC, you can use OBS to stream or record your gameplay from PC games directly on your PC without buying any of the above devices! So if the above is too expensive, then you could get started without buying anything by playing and recording PC games using OBS. would all of this also work on PC instead of the other consoles? Thanks for explaining the whole process in detail. I have managed to stream after going through your article. Keep up the good work. Can OBS capture game on MacBook Pro 2009 or do I need a better gear. I have a AveryMedia LGP2 and PS4 Pro already to go but how would I record the audio I am not streaming just capturing the game with audio from the mic and the game, also for audio I want to use the Yeti Mic I just don’t know the correct setup to use. I don’t know, macs are inferior laptops with very poor graphics and very slow despite the fact that you overpaid two grand for the laptop; it is really only worth about $100 which is the cost of the hardware. You might be able to use OBS on your slow mac pro, but if you had any pc it would be way faster. You can try it, then let me know if it worked. Your Averymedia card should also transmit audio over HDMI. If you mean how do you capture voice audio, you can use a USB microphone which is the best solution, or you can use a mic with a headphone jack and plug it into your averymedia capture card, it looks like yours has a mic in headphone jack port. Your Yeti mic is a USB microphone, you can simply plug that into your computer. Your mac though it a very inferior laptop and no guarantees it would work. If you had any pc it would work simply by plug-and-play and you can use OBS to record the audio, or you can record the audio using a separate software and then sync the audio. What happens if I plug the yeti mic directly into the Mac and record my end of audio and combine it in post but will that overwrite the orginal audio from the game. No if you know how to do it you should have two audio streams, one audio stream of the game and one audio stream of voice from the mic. I don’t know how to setup can you explain it to me. What if you have an input to hdmi and the computer doesnt read it? I am connecting the Wii u to the computer via HDMI. 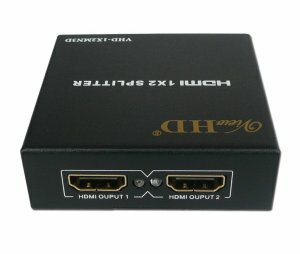 Do i need a HDMI Splitter+1 more HDMI cable? Most computers do not have an HDMI input. It would be extremely rare for your computer to have an HDMI input, but if you do you will see two HDMI ports, not one. If you have only one HDMI port in your computer, it is actually an HDMI out, not HDMI in. Due to this, you cannot just plug the device directly to your computer. This is why dedicated gaming devices exist, because there needs to be a way to send HDMI over USB, since USB input is the only way that you can get the video signal into your computer, since your computer does not have an HDMI input. Remember the rule, if you only have one HDMI port, it is an output, not input. Next, remember that it is extremely rare to have an HDMI input – in fact, I do not know of any computer, laptop, or hardware with an HDMI input today – if it exists, it is extremely rare and your PC is probably not one of them. Third, keep in mind that many PC discrete graphics cards (the big things that you add in separately) may have two HDMI inputs, but again it is extremely unlikely this is an HDMI out since it is designed to be able to connect multiple monitors, which means all the ports are outputs, not inputs. Let me know if this helps. If you are absolutely certain that you have an HDMI input, please reply with the make and model of your PC or laptop, or, your graphics card, so that I can let you know for sure if that is HDMI in or out. There’s your problem right there. Sell that overpriced inferior Alienware while there is still a market of people silly enough to buy it from you, and build a PC for 1/10th of the cost that is 100 times more powerful. Moreover, even with an hdmi in, you would still need the software to be able to run it. You can try OBS (Open Broadcaster Software) which is free, but there is no guarantee it will work with your HDMI drivers. Not only that, but there is no guarantee it would even work with your hardware. Though I should say, recording gameplay works fine after turning off HDCP on the PS4, but some other applications (movies, for instance) may still not work. If you want to capture those kinds of things, you may still want a splitter/stripper. That’s correct, you can turn off HDCP to allow some basic streaming on the PS4 (or Xbox One), but it is also limited to only a few instances. If you want to be able to entirely stream everything on your screen whatsoever, you must get a compatible HDMI splitter (not any splitter, see the post above for details), otherwise it will show a black screen for anything that is blocked from HDCP. Additionally, this HDCP feature can be disabled at any time in a future update, so it is better safe than sorry. After all, it’s only a few dollars. Could you explain the set-up down to the last detail because I have tried this and I cannot get a picture to come through on my capture sofware. Would appreciate it if you could. 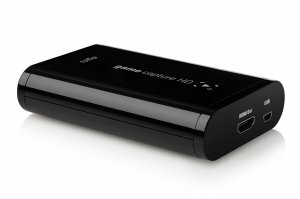 Can I Hook up a capture device to both xbox 1 and ps4 with an hdmi splitter? I heard the signal will be messed up if I do. Yes, you can do that just fine, It won’t affect the signal because you will only have one signal going through the splitter at any point.